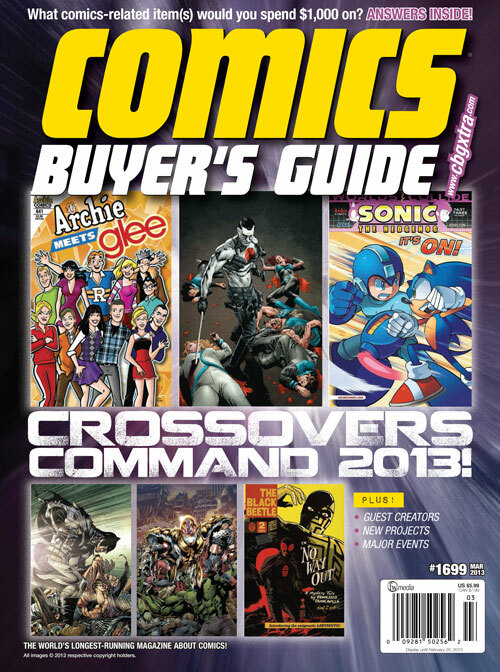 ABOVE: Cover to last issue of the CBG. 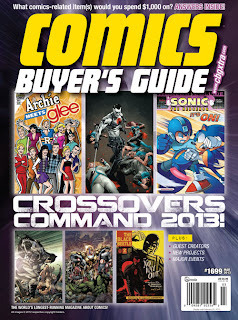 I could not let the cancellation of the Comics Buyer’s Guide (CBG) pass without mention. Earlier this month, its parent publisher, F+W Media, announced that it would be shutting down the 30-year magazine with issue 1699, just one issue short of issue 1700. I received my copy of the last issue recently and it’s clear that this was a sudden, last-minute announcement since no mention of it is mentioned in the issue. While the news was a surprise to me, even without being privy to the magazine’s financial situation, it probably shouldn’t have been. Like many other publications struggling in the traditional print domain, the decision was based on “freely available comics information online, declining paid circulation and advertising, and the costs and constraints of print,” which its publisher said made publishing the CBG “financially and operationally unsustainable.” Once arguably the paper of record and central meeting place for comic-book collectors and fans, the CBG successfully re-invented itself over the years to remain viable: initially an “ad-zine” for people to sell and trade comics, it eventually became more of a source for comic-book industry news and comic-book reviews. The advent of up-to-the-minute news online, however, obviously made that model difficult to sustain. Recent postmortems seem to show that the magazine was primarily serving an increasingly ageing, shrinking collector’s niche, and, as an excellent overview of the magazine’s history by John Jackson Miller, who is a former employee, shows, the magazine missed the boat on building a strong online presence, mostly because that was not an area of focus for its parent company, which otherwise continued to do well publishing other types of enthusiast magazines. I personally first stumbled across the CBG in the ‘80s and became a regular subscriber beginning in the ‘90s when I became more serious as a cartoonist and publisher. As many others have said, until then I was a fairly isolated comics fan, so the magazine revealed to me a larger, broader comics fandom that took the form as seriously as myself. 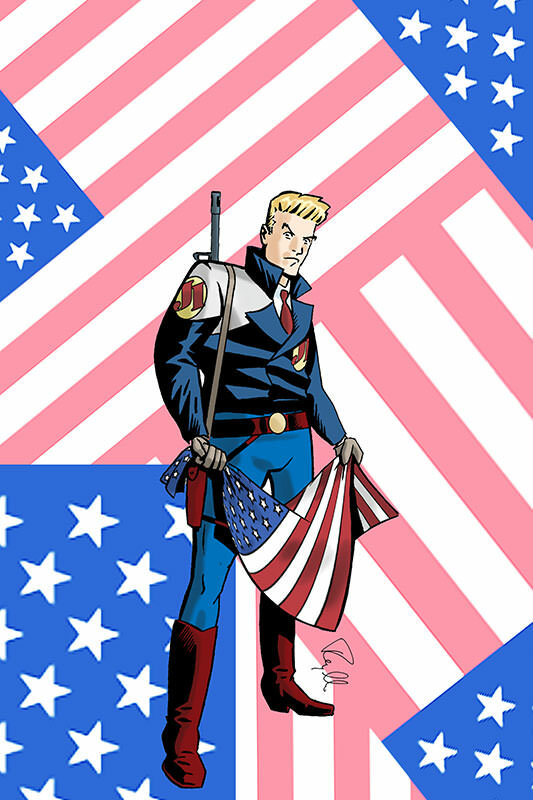 Back then, comics was a smaller and less disparate community, so it was relatively easy to get news coverage, reviewed and have letters published in the magazine, as I did on several occasions. Though I wouldn’t say I was “friends” with the staff and editors there like Brent Frankenhoff and Maggie Thompson, I’m proud to say they know of me and my work. The industry is now much larger and more diverse — all good things — but, as a result, the CBG appears to have been left by the wayside, perhaps looking a touch too stodgy, obsolescent and antiquated compared to new, more dynamic online websites that appealed to younger fans. There are several online sites—particularly the Beat—on which I have relied for years for breaking news, reviews, and other comics-related information, but I always looked forward to sitting back with the less-transitory feel of the CBG and its print format, always finding it to be a good source of new comics and industry news that retained the community feel of fandom back in the day. Perhaps that’s a reflection of my age as well, but regardless, I’m going to miss the homey, non-snarky, welcoming quality the CBG always conveyed.